Just a couple of years ago, 13-year-old Derrick was collecting discarded plastic bottles to earn 12p a day on the streets of Kampala. This week, he was having school lessons and making crafts in Lisburn Cathedral Halls, along with other young members of the Abaana New Life Choir. The choir is currently on a five month tour of Ireland and the UK and Derrick and the children he is travelling with are walking, talking, singing proof that a little help can really transform lives. Happy to be singing and dancing in Ireland. Abaana, meaning ‘children,’ is a charity based in Bangor, Co Down. It was established by Scott Baxter, its Chief Executive, who was so moved by the poverty and need he encountered on a visit to Africa that he founded a charity giving hope to others, providing communities the opportunity to help solve their own problems. Education is one of those tools and Abaana has been partnering with local churches and other organisations for 19 years. It has built 13 schools in different parts of Uganda, and runs a number of children’s homes. 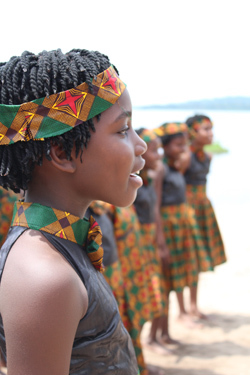 The 20 children taking part in this first ever New Life Choir tour all come from Abaana schools and are aged 8-13. Neville Jones, the charity’s Assistant Director and a parishioner of Lisburn Cathedral, has been involved in organising the tour. He explained that the children are sponsored by people in the UK. “The children represent their friends and communities and are hoping that through being here they can get more people in their communities sponsored so they can have an education as well,” Neville said. The tour is underway and continues until June 4 (concert dates). The choir will visit Lisburn Cathedral to perform during the parish weekend on March 18, and will also sing in St Mark’s, Ballymacash, on May 31, but there are other dates in other venues within Connor Diocese. The children are accompanied at all times by 10 chaperones, four who have travelled with them from Uganda. One of the local chaperones is 27-year old Victoria Bell from Lisburn Cathedral, who has taken time out from her job as a teacher to be with the children for the duration of the tour. The children’s visit to Ireland is causing great excitement among members of Lisburn Cathedral’s youth group Mettle, who sponsor Derrick. Derrick’s life has indeed been changed. Due to family difficulties, he ran away from home and walked three days to reach Kampala. He lived for three years on the streets. He collected plastic bottles, earning around 12p a day for his labours, just about enough to by a chapatti (pancake). Gareth shows Derrick the video made by members of Mettle. It was his friends who pointed Derrick in the direction of one of the progammes Abaana runs for street children. Neville said Abaana works with social services in Uganda to identify young people who would benefit from a place in one of the charity’s homes. Some, he said, would not be interested. The decision to move into a home has to be made by the child. “When a child beds down on the streets, all they think about is will they get through the night safely, or will they eat the next day. Their horizons don’t extend beyond that,” said Neville. That meeting took place this week at the Cathedral, which hosted the choir for two nights, but before they met up, Derrick was shown a short video recorded by Mettle in which members welcomed him to Ireland, and said how much they were looking forward to the concert next month. 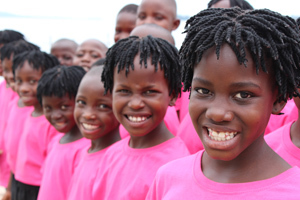 The New Life Choir tour is aimed at raising awareness of Abaana’s work and bringing in more child sponsors, but Neville said being on a tour like this is potentially life changing for the children involved. Not only are they singing in front of large crowds – they will sing at the Kingspan Stadium before Ulster Rugby’s match on March 3 – but they have been on planes and boats and buses for the first time ever. During their time on the road, the choir and its chaperones are hosted by families from the different churches in the places the concerts take place. 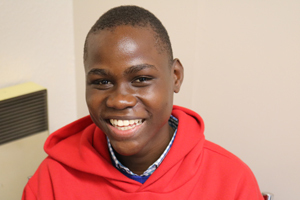 The good news is that Derrick is back in contact with his mother – Abaana’s ultimate goal is to resettle the children who have lived on the streets with a family member.